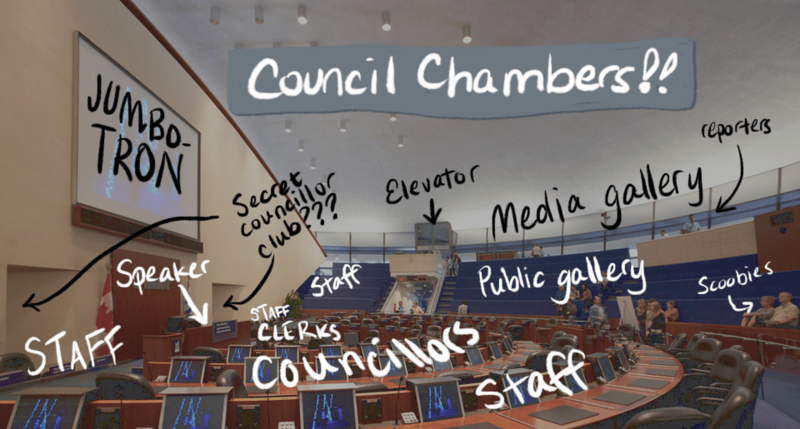 With the 2014-2018 term about to start, I thought I’d provide a brief primer for people who want to start watching City Hall in person. Where to go, what to see, where to eat, and more. The awkwardly named Toronto Meeting Management Information System—TMMIS (pronounced “tea-miss”…or “tim-miss”…um, I have contacted the Clerk’s Office for clarification) for short—is your one-stop shop for schedules, meeting agendas, data, and documents. Council meetings aren’t the only things to watch! As a rule, all these boards and committees have public meetings. Not all of the meetings are at City Hall and not all of them start first thing in the morning, so it’s always a good idea to double-check. Council meetings (and committee meetings of interest) are livestreamed and archived by Rogers. If you have cable, you can also watch the livestream on Channel 10. If you prefer to get updates via Twitter, it’s a good idea to follow City Hall journalists. The Sun’s @reporterdonpeat in particular is indispensable. Giant version at the link. Here’s the ground floor of City Hall. The people at the help desk can direct you if you’re not sure where you’re going. Committee rooms and councillors’ offices are on the second floor. You can’t really just wander in to the offices, you have to make an appointment and sign in at the desk. The washrooms are tucked away in the hallways behind the committee rooms and are much nicer than the ones on the ground floor and in the basement. Original photo by Roland Shainidze (source). There’s, like, three different third floors. The one you want is 3C (C for Council). Half the room is roped off and only councillors and staff can go in. Members of the public sit in the gallery (the blue seats). Above the top row of seats is the media lounge, with desks reserved for various news outlets. You’re not allowed to eat or drink in council chambers. This means you will probably have to take breaks to refuel. 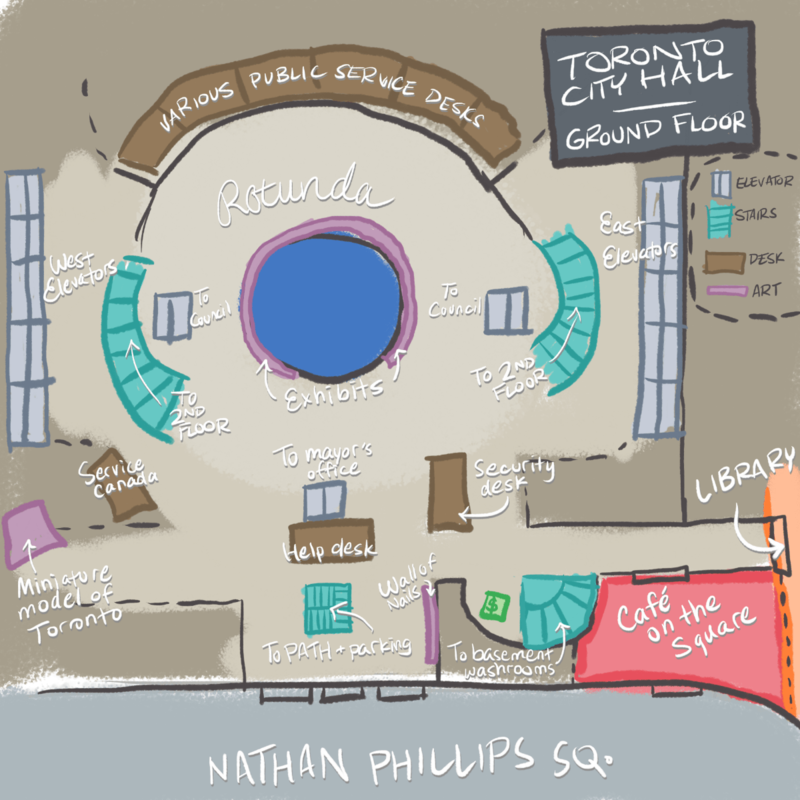 Café On the Square is the most convenient place, but there’s also the food trucks of Nathan Phillips Square, a Tim Hortons on the other side of Queen, and the Eaton Centre food court. A bit farther afield is the food court at Village on the Grange, near OCAD. City Hall has free wifi; the network name is CITY-OF-TORONTO. There’s also the library’s wifi. Power outlets are in short supply. Some desks in the committee rooms have outlets underneath them, but if you can’t sit there you’re out of luck. There are only a few outlets in council chambers. However, you can always go to the library to recharge, as they have plenty. I recommend getting an external battery pack that you can connect to your phone or computer with a USB cord. They’re useful to have in any situation. At committee meetings, members of the public can make speeches about items on the agenda, and committee members can ask them follow-up questions. Jargon alert: the speech is called a deputation (rhymes with “reputation”). The speaker who deputes (rhymes with “cahoots”) is a deputant (I actually don’t know how to pronounce this). WiTOpoli has prepared a short guide to making a deputation. When you find the item’s page on TMMIS, there will be little buttons at the top that say “Submit comments” (a written submission) and “Request to speak”. These launch an email draft with the proper address and subject line filled in. Overtly political signs and banners aren’t allowed in council chambers. You can, of course, Make A Statement by unfurling a banner and getting thrown out by security, but they may not let you in if you want to attend the rest of the meeting. The most popular place for protests is right outside the front doors of City Hall, although sit-ins outside the Mayor’s office are also a good choice. If you sit in the front row of the gallery you not only get access to the few precious power outlets, but councillors can easily wander by to chat. Be considerate and don’t talk too often or too loudly; other people are trying to listen. If you really need to have a tête-à-tête, step outside or move to an empty part of the gallery. Finally: network, network, network! Figure out who your councillor is and introduce yourself. Connect with activists and community groups at meetings. Say hi to people you recognize from Twitter! And be nice to the staff.